Apple has taken a lot of heat lately for falling behind some of their competition when it comes to the resolution of their iPad Air with Retina Display. Although the iPad Air’s display quality is quite good, some people still complain that is isn’t good enough, considering the Kindle Fire HDX has a way higher resolution. The current Kindle Fire HDX has about one million more pixels than the iPad Air; 2560 x 1600 and 339 pixels per inch with an 8.9 inch display. The new iPad with a 12 inch display that everyone has been hearing rumors about recently may be Apple’s answer to this issue. According to new rumors, they are currently testing their future iPad release right now with 2K and 4K resolutions. According to un-named sources, there have already been several prototypes on this new tablet. Need A Large Quantity Tablet Rental For Your Business Project? If this is true, the new iPad would be one of the most impressive tablet releases that we have ever seen. The resolution would likely be 4096 x 3072, which is even higher than the 4K Ultra high-definition televisions that have come out recently. The current iPad Air is 2048 x 1536 at and 264 pixels per inch, and the resolution on the new version would be literally doubling that. This change would be one of the most pleasing things that Apple could ever do for their fans. That, and smartscrolling. But we shouldn’t get our hopes up, just in case. One rumor that can’t really be taken too seriously is the release date for this new iPad. You can find more guesses on that than there are pixels in the new display. Originally everyone thought it would be coming out in early 2014, but my guess is that it will have a more traditional release date of later 2014, maybe around fall. Another thing people say is that the 2K release will probably be mid year, with the boosted specs version having the later release. The NEW iPad Mini With Retina Display Is Here! Every holiday season can mean many things to many people, and even many companies. To some it may mean family dinners, holiday shopping, milk and cookies and a warm fire place. To others, like the companies out there, it may mean it is time to capitalize on the competition and the holiday season by bringing putting out the best products our company can offer currently. Well the Apple and its tablets have gone ahead and utilized that prospect wholeheartedly. The tablet game has been going strong, and its only getting more complex as the holiday season draws closer and closer. Well Apple has one more trick up their sleeve this year.The new iPad Mini with its Retina display is now available for all consumers and is really shaping up to be one of the best possible tablets to purchase this year with everything it has to offer so far.So what exactly can this new mini tablet offer up to the table? Well how about starting with the one thing that everyone seems to gawking at. The new 2,048 x 1,526 pixel count Retina display. For such a smaller screen than the recently released iPad Air, that is quite a large pixel count. The newly introduced A7 chip processing unit along with the co-processing M7 chip are also featured in the in iPad Mini Retina. It just so happens that both of these chips are also included in the iPad Air as well. Both of these chips working together means much faster functionality due to the M7 chip taking over all motion functionality processing and leaving the rest for the A7 chip to handle. Weighing in at only 0.73 lbs and boasting a 7.9 inch display, it would seem that this new iPad Mini is basically the new iPad Air only…”Mini”. They do host the same specs after all. The only real draw back to the new iPad Mini is the $399 price tag. As with most Apple products, this one comes with a decently sized price. Having said that though, it is still $100 cheaper than the new iPad Air and is basically the same thing. This is perfect for anyone not wanting to haul around a larger tablet but still wants the freedom and mobility of a top quality tablet. The $399 is also starting price, so if you choose to get a higher memory storage or are planning to get LTE service as well, be prepared to have the price increase pretty substantially. It may be a better benefit to rent this before buying just to see if the size itself would be the best fit for you, along with all of the capabilities of the device. This could be a great fit for the office as well, with its storage size being able to be expanded up to 128GBs, holding documents, memos, and even setting up your programs and apps. Any office could benefit from new tech, but now even class rooms are beginning to utilize tablets and the iPad Mini could be perfectly suited for teachers and students alike. That is, if it is within the schools budget of course. 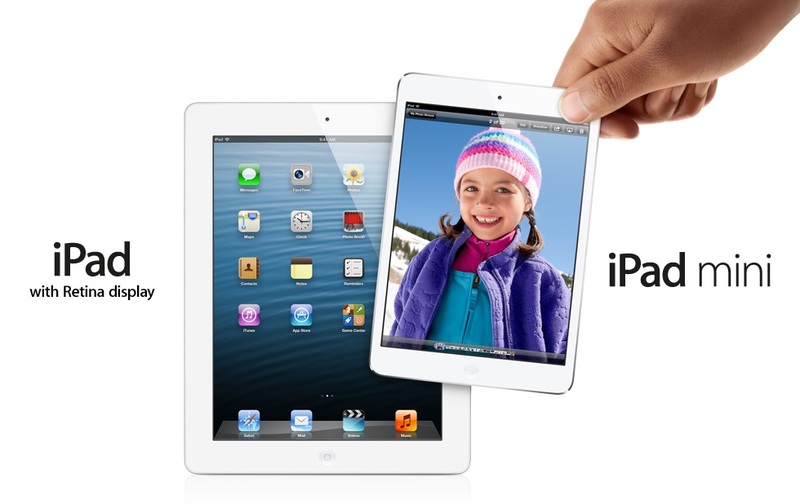 Be sure to check out the new iPad Mini today, or rent one today! You may have something else to add to your Christmas list! Tablets are growing in popul arity. By 2015 tablet sales are predicted to top desktop and laptop sales combined. Sales in PCs, tablets, and mobile devices are expected to reach 2.4 billion units in 2013, and grow by another .6 billion by 2017, according to data Gartner provided Cnet. The release of more efficient, lower costing tablets, has no doubt accelerated this growth in popularity. Tablet sales are predicted to reach 337.8 million units in 2015 while PC and laptop combined sales are expected to come in at 292.2 million units. 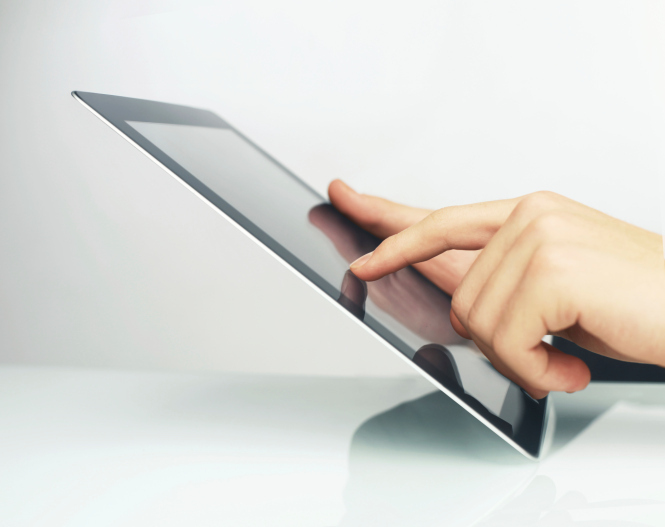 Whether you are renting a large number of tablets for a convention or a singular one for personal use at school. RentOurTablets.com is here to assist you with your short to long term tablet rental needs. Apple’s next generation of iPad will be 15% thinner and 25% lighter than the fourth-generation model. The reduction in its size is due to a handful of modifications. The battery is supposed to be 25 percent to 30 percent smaller and improvements on display panels and A-series chip technology, which now uses less energy. Apple also will use the same touch technology found on the iPad mini, which is thinner than what it currently uses on its full-size iPads. This is just the latest in a series of rumors and murmurs pointing to a slimmer iPad. Apple’s used what’s effectively been the same outside design for the device for the past three versions, something of an abnormality when compared with the iPhone and iPod line. Microsoft recently announced that it has relaxed a Windows 8 certification requirement, allowing devices with lower resolutions. According to analysts, this move signals that Microsoft could be the next company in the industry to make the shift to smaller, less expensive tablets. According to IDC Analyst Bob O’Donnell, “The sub-eight-inch part of the tablet market will be growing this year to about 55% of the entire market. Microsoft hasn’t even been playing in that segment, and they needed to do something.” Microsoft laid out all the details of the new relaxed rule in a newsletter released March 12 by its certification program. The program oversees use of the Windows logos that OEMs display on their hardware. Microsoft made it clear in the newsletter that even though it will allow lower-resolution devices, it would still prefer that original equipment manufacturers continue to work with higher resolution screens. Microsoft also detailed that the exact specifications of the new resolution are 1,024 x 768 pixels. The previous stipulations of the Windows 8 certification, which also applied to Windows RT, required screens with a minimum 1,366 x 768 resolution and a 16:9 aspect ratio. This lower resolution rule would allow for tablets running Windows 8 and RT to be smaller in size, comparable to Apple’s new iPad Mini. This move by Windows is obviously an attempt to stay competitive with the two other big names in the tablet industry, Apple and Samsung. 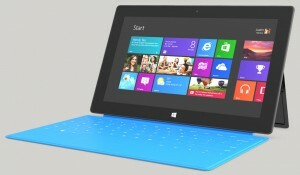 Smaller Windows 8 tablets would be able to compete against Apple’s iPad Mini and Samsung’s Galaxy Note 8. If you want to try out the Microsoft Surface running Windows 8 or the other tablets mentioned in this article, like the iPad Mini or the Galaxy Note 8, then RentOurTablets.com is where you need to look! RentOurTablets.com has a wide selection of products, meaning you can rent an Android tablet or rent an iPad whenever and wherever you need it! Microsoft has announced the release date for their Surface with the Windows 8 Pro operating system as February 9th, 2013. The Surface with Windows 8 Pro has gone through a major overhaul when compared to the Surface with Windows RT. The Windows 8 Pro operating system will allow users to continue using Windows 7 applications and will integrate with your existing infrastructure. The security system underwent significant upgrades. AppLocker and Group Policy will now allow application and security policy control. BitLocker gives the user the enhanced data protection. Furthermore, Windows 8 Pro is compatible with third party security systems. The Surface Pro with Windows 8 offers more memory than the Surface with Windows RT. The Surface Pro comes in both 128 GB and 64GB models with 7GB of free cloud storage. Each model is packed with 4GB of RAM. The Surface Windows RT comes with only 32GB or 64GB models. The screen is another Upgrade with the standard now being a 10.6″ with 16:9 and 1920×1080. The new system is now 13.5 mm in thickness and weighs 2 lbs. In comparison the Windows RT is 9.3 mm in thickness while weighing in at 1.5 lbs. USB port is now a 3.0 versus the 2.0 and the HD video out port has been replaced with a Mini Display Port. The Mini Display Port is an open source port and allows for higher resolutions using smaller connections. 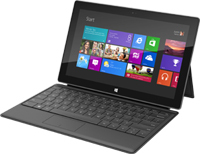 Find out more information about the Microsoft Surface Tablet Rentals! How Could a Laser Projected Keyboard Not Be Popular? When I first heard about this laser projected keyboard I was fired up and ready to plunk down $199 for this cool gadget. After reading several reviews and watching several videos I had more questions than answers. Even though this technology has been around for over 7 years it still seems like it is undiscovered. Why has it not caught fire and been that popular among consumers? The Magic Cube made by Celluon is featured as a full QWERTY keyboard and multi touch mouse that is projected onto just about any surface. It can be used with a variety of products ranging from smart phones, tablets and PCs through blue tooth technology or USB connection. It is small and portable and sounds like the perfect solution to the small keyboard dilemma for people with fat fingers, like me. Cnet.com had a modest review citing mostly the features it is designed to do with a 3.5 out of 5 star review. However, laptopmag.com, wired.com and maclife.com were more vigorous in their reviews. All agreed it is fascinating technology but with some practicality issues. The cost ranges from $120-$260, which seems relatively high in range for the technology we’re talking about here. The idea of the convenience and ease of use seems not so highly supported. The technology itself seems to be at issue. TopLevelReviews posted a pretty succinct review that was helpful for me, being the visual learner that I am! In the YAY column we have: the cube is compact, portable, easy to set up and install (most of the time). In the BOO HISS column we have: battery lasts 2 hours but takes 4 hours to charge, multi mouse only seems to work well with windows devices. Detection rate is supposed to be 350 characters/minute, however, that has been debatable among users. Also keep in mind it is a QWERTY keyboard and not a standard keyboard. The punctuation and other features like caps lock is not going to be the same and is tricky to get used to. Overall, I would have to say that if it were less expensive I would probably take the chance and try it for myself because I think it is a really cool concept. 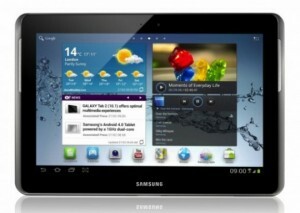 The Samsung Galaxy Tab is one of the best Android tablet contenders against Apple’s iPad, and with good reason. The Galaxy Tab offers a viable alternative to the iPad as it is just as compact and lightweight as Apple’s flagship tablet. In addition to that, it comes in a variety of different configurations and sizes, allowing you to have a greater array of devices to choose from than the iPad. As far as features go, Samsung’s Galaxy Tab comes with two cameras, a front-facing and rear-facing, allowing you to easily capture pictures and video of yourself or others or even video chat or hold a video conference with others. Another great feature of the Galaxy Tab is the live panel home screen. The live panel home screen is a customizable home screen that allows you to have access to to real-time data updates on apps and widgets, which means you will always have the latest info whenever you need it. The customizable home screen also allows you to have a truly unique experience from other Galaxy Tab users as you can personalize it to your heart’s content. The Galaxy Tab also comes with HSPA+ and WiFi access, allowing you to stay connected wherever you are with fast and stable connections. This means you can browse the internet, download apps, run apps and do anything else you could possibly want at lighting fast speeds. Renting a Samsung Galaxy Tab allows you to have access to all of this without having to shell out the cash required to buy one. A Galaxy Tab rental grants you access to everything the tablet has to offer for however long you need it. Only need it for a weekend trade show? No problem! RentOurTablets.com offers all three versions of the Galaxy Tab: The Galaxy Tab 2, the Galaxy Tab 2 7.0 and the Galaxy Tab 2 10.1. All models come with the option of 3G connectivity, allowing you to stay connected even when not in range of a WiFi hotspot. No matter what your circumstances are, RentOurTablets.com can put the Samsung Galaxy Tab in your hands for a price you can afford. iPad mini, or iPad with retina display? Lighter and more portable, or two times the speed and bigger screen with an extremely crisp picture? The Only thing it seems the mini has going for it is convenient size and the fact it costs less than its larger older brother. If holding your iPad in one hand or being able to store it in your purse is a concern, then the iPad mini may be right for you, being only .28 inches thick, and weighing only .68 pounds. If you watch movies, play games, use it for school or work. The new iPad may be the better pick because of its 9.7 inch and high resolution of 2048 x 1536. Tablet PCs are very cool pieces of technology but a lot of people don’t really need one on a long term basis. Many people get them simply because they are trendy or they don’t need all the features that come with a laptop, but these devices do have a lot of productive uses and are perfect for college students or businessmen who are always on the road. One thing that tablet PCs allow you to do is take them everywhere, including a classroom, business meeting or trade show. You can buy digital copies of books from online retailers and read them directly on your tablet or download different business apps that allow you to fully connect during a meeting or presentation. However, even though tablet PCs are extremely convenient and cheaper than buying a fully-featured laptop, they are not always cheap. Sometimes tablet PCs can sell for as high as $600, which is a lot to throw down if you ask me. That is where RentOurTablets.com comes in with its full line of tablet PC rentals. RentOurTablets.com allows you to rent a tablet PC for a period of time, like a school semester perhaps, so you can have all the conveniences of a tablet PC without the cost of buying one. In many cases, renting a tablet is far less expensive than buying one, especially if you are a student where money is always tight or you don’t have a long-term need for one. RentOurTablets.com has many regular tablets in stock, like Apple’s iPad, and even some convertible tablets (devices that convert from a laptop to a tablet) like the Inspiron Duo Convertible Tablet from Dell. You can even rent Microsoft’s new Surface Tablet, which comes complete with Windows RT. Tablets can be expensive and unless you are planning on using yours all the time, it doesn’t make sense to jump in and spend a lot of money on one. If you need one for a school semester to save on books or for a business meeting that you are taking out of town, then renting a tablet is your best bet and RentOurTablets.com can get you whatever you need.